One of the bad reasons that could apply to any question, but seems to be a very likely candidate for this question, is being unaware of the state of the world. Forecasting the future when you don’t know the present just isn’t going to turn out very well. In the best case, you’ve got really good priors, and you’re stuck working off of those. Realistically, your priors aren’t that great. Evidence could help them out, but you’re not updating. In the specific case of the Bluefin-21, it was suggested (by someone with whom I have no beef, and am not trying to single out!) that there was still a chance MH370 would be discovered by going back and reanalyzing the data. This didn’t seem at all likely to me. I attempted to explain why, though in retrospect I think my explanation was poor, and incomplete. To formalize my reasoning, I hunted around for a software tool that would let me crunch the numbers and make a diagram. I turned up GeNIe, which looked appropriate for the task. GeNIe is a GUI on top of SMILE, which is a software library for (hand wave) modeling Bayesian networks. Weee, the chance that Bluefin-21 will find anything has now dropped to basically zero. And that’s because not finding the MH370 on the first pass is evidence that it isn’t there, even if Bluefin-21 is imperfect. In fact, the better Bluefin-21 is, the stronger the evidence of absence. 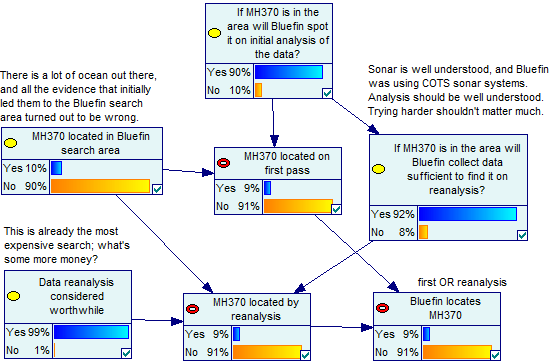 For any chance of detection to remain, Bluefin-21 would have to be good at collecting data, but the analysis would have to be awful and error prone, unless you repeated it. I didn’t attempt to model that in, because it would be so weird. This question is pretty much over, but if you have suggestions for making the model better, I’d be interested in hearing them. This is the first thing I’ve done with this sort of modeling tool. So I’m sure some things could be done better. I plan to make further use of GeNIe for my SciCasting. For starters, the models make it easier to break apart the separate components of my belief. I can also tweak nodes and have the machine handle propagating the change, which will be much more accurate than fuzzily doing it in my head. 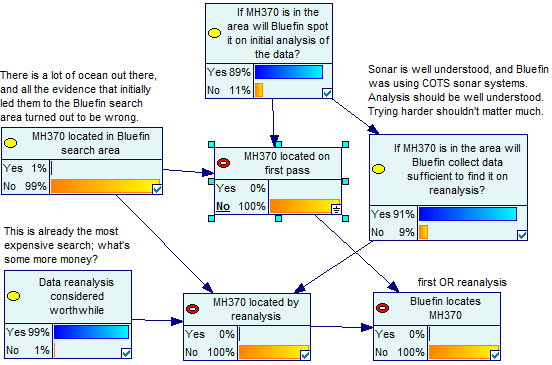 This entry was posted in Analysis, Guest Posts, Resolved Questions and tagged analysis, Bayesian, Bayesian networks, Bluefin-21, GeNIe, Malaysian Airlines, MH-370, MH370, SMILE by Jessie Jury. Bookmark the permalink. I think many of the forecasters don’t even read the questions. Otherwise I have no idea why they make the bets they do. For example, the market currently says we have a 15% chance of finding life on Mars in the near future. WUT. I’m happy to see someone sharing thoughtful analysis on a SciCast question.